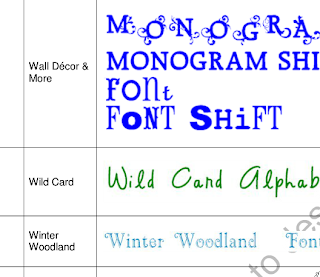 Obsessed with Scrapbooking: Handy List with Samples of all the Cricut Fonts! Handy List with Samples of all the Cricut Fonts! The most fabulous Narelle has updated her fantastic list of fonts that are on the Cricut cartridges! You can check it out HERE on her blog, Cricut Lover's Guide to Design Studio. Leave her a sweet comment, please, as this was a ton of work! WOW....can't believe she did all this and thank you for the great info.... you are always on top of everything! I have a list like this and it is great. Thank you for sharing. Thanks for the list!! Have a nice Thanksgiving!! This is an invaluable tool! I don't know how many times I have wanted to do letters but didn't know which one ~ this will serve a good purpose for me. Thanks. Thank you for taking the time to do this and share with us. Just yesterday I spent lots of time looking for a special font. This is amazing. This is terrific. Thanks for sharing. What a wonderful gift to us! This list makes it too easy to pick the font for your project! Thanks for sharing! Thanks for so much for telling us about this wonderful resource. I love being able to preview the fonts. I might even start collecting font carts again! Awesome resource! Thanks so much! FYI - the "You Might Also Like"...."free fonts" - says the pages do not exist. Thanks for sharing this great info.!!! Hey I'm back again, I printed out the Font list and left an appreciative message...the list is awesome ladies....prints out in a flash....so just do it...you won't be sorry!! Thanks again Joy for the heads up on this!! Hi, I know this is off topic but I had an idea and I did not know how to get it to Provo Craft. I thought you might be able to. I was on the cricut rewards site and I thought since they now have the craft room and offer digital cartridges, maybe they could allow us to get some digital images with our rewards points. Thanks for the chance to share my idea. Love the blog. Thanks for sharing this. I am going to save to a jump drive so I can carry with me. That was a time consuming job. What a great list to have. Thank you so much the list. It is greatly appreciated. Thanks sooo much for the download, I passed it on to my fellow croppers! Awesome - now I can pick more to buy!! Thanks for sharing!! Awesome this was exactly what I needed!! !